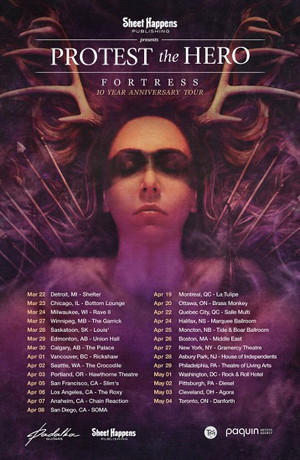 In celebration of the 10 year anniversary of their Gold-certified album, Fortress, PROTEST THE HERO has announced an extensive North American tour. The tour kicks off in Detroit on March 22nd with 11 dates across Canada, and wraps with a special show at Danforth Music Hall in Toronto on May 4th. Tickets for the shows are on sale as of Friday, December 1st at 10 AM, ET via protestthehero.ca/. Limited VIP tickets are also available to purchase HERE. Recorded in 2007 at Silo Studios with producer Julius Butty, Fortress debuted at #1 in Canada and also nabbed the #10 spot on the US Billboard Top Independent Album chart. Mike Portnoy, famed drummer and co-founder of DREAM THEATER, named Fortress one of his favourite albums of 2008. Like its predecessor Kezia, the album achieved universal acclaim with high praise from several major publications. Support for the tour will be announced in January 2018.